Every spring, we await the arrival of luscious greens and flower blossoms. Without the bee population humans would have to take paint brushes to pollinate each and every plant, flower by flower- an overwhelming and impossible task at best. Bees are estimated to be a billion dollar industry and they are dying. We must become aware of their impact on the environment and protect them. For over ten years, nature has inspired my creative process. Through my art, I hope to begin a dialogue and a push towards saving our environment. This series is a macro view into the cycle of death of the bee population. Recently, I found a spot where bees are dying consistently. I captured images of the dead or dying bees with my camera and have carefully collected each specimen. There are roughly 40,000 to 60,000 bees in one hive. 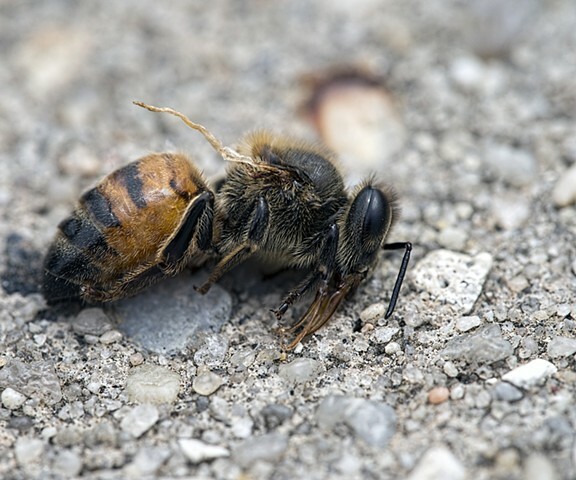 By displaying this representative group of 25 images of individual dead bees, perhaps viewers will come to understand the reality of this crisis. The death of 25 bees may seem insignificant, but multiple that by 10,000 and you can quickly understand the impact their death is having on our environment. We must stop the use of pesticides and plant more wildflowers.